We want a government that's small enough to listen, big enough to tackle real problems, smart enough to spend our money wisely, and honest enough to be held accountable for results. We need your help. The California Community College system and Governor Jerry Brown are looking to launch an online-only community college to help working adults. The college would be designed to help those looking to boost their skills or complete a post-secondary program but for whom personal responsibilities or distance can create barriers to higher education. 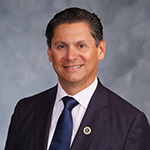 The plan to create this college originated with a request from Brown, who touted the idea last week in his final State of the State speech as governor. What do you expect the "student body" for the online community college will look like---who is the target audience for this effort? Chancellor Oakley: The online college will focus on short-term certification courses tailored to working learners who need a flexible, high-quality and affordable learning option. This is a new, modern and necessary approach to make higher education more equitable. Some 2.5 million Californians between the ages of 25 and 34 have only a high school diploma or some college, but no college credential. The online college would offer competency-based education available on-demand. Through partnerships with industry and organized labor, the college would offer the skills employers want on the schedule today’s students need. It will benefit working adults who are unable to attend college in person or access traditional online offerings due to work or family obligations. California can’t afford to leave working adults behind. The proposal has received a lot of support, but the Teachers Union is preparing to fight it. Does their opposition surprise you? Some groups have raised concerned and questions, which we look forward to answering as we fully design this learning platform. Faculty will play an integral role in the development of the 115th college and have an opportunity to provide a quality, public alternative to online programs offered by for-profit institutions that have not always served this population well. The California Community Colleges will lead the way for working learners who need non-traditional options to acquiring skills and credentials, and we have heard from faculty who share this vision. One of the points they make is the quality of teaching online is less than what you receive in the classroom. How do you answer that? Our experience with our existing traditional online education courses, which are predominately degree and transfer level courses, undercuts this argument. 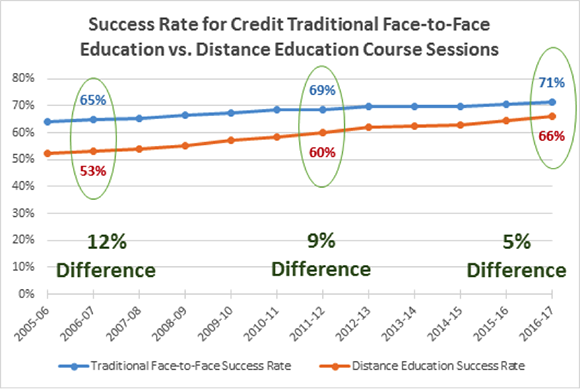 Our faculty have made great strides in recent years to improve the quality of distance education as you can see in the chart below. It’s disappointing that some are discounting the success our faculty in improving completion rates in online settings. We reject the notion that this population cannot learn online. Unfortunately, this thinking is typical of sentiments that have led to historical bias and barriers in education. Another point they make is there are 114 community colleges so for most Californians, there is one nearby and convenient and many of them are already offering online courses. What are they missing? We are proud that community college campuses are abundant in our state and serving students from all backgrounds. We are the economic engine of California. The reality is, however, that proximity does not always work in favor of working adults who cannot come to one of our colleges during a traditional academic calendar because of work or family obligations, or both. Some 80 percent of the population we a looking to serve are working adults. As much as we would like them to come to our brick and mortar colleges, it is shortsighted to assume that they have the time and ability to do so. One of the criticisms community colleges received from the employers around the state is the slow response to a changing economy--it takes too long for courses to be developed to adequately prepare a workforce---Will the online community college be more nimble in that area? We are cognizant of this criticism from the employer community and we have taken a number of steps, including the streamlining of curriculum approval processes, to do better in this area. The online college provides us the opportunity to take this to the next level because we will seek out employer partners that can inform the design in a way that will provide work-based learning opportunities for these students and result in better wages and employment outcomes for students and businesses. Assuming the Legislature approves, when will the college "open"? The goal spelled out in the governor’s budget proposal calls for the online community college to be up and running and enrolling students in the latter part of 2019. Join us, tweet us, and watch us.